I typically do not get too worked up over the comments people make. Most people are ignorant to the words they speak or the impact they have. Most people have not experienced the horror of a suicide and so they cannot possibly understand the pain attached to the flippant comments they make. I cannot get worked up over every insensitive comment every person makes. I cannot control the words others speak. Sometimes people make the statement that a certain move at work would be “career suicide.” It doesn’t offend me, I understand what they are saying. That move could kill their career. I get it. There is probably a different way to phrase it that may be more tactful, but at the end of the day, I really don’t care. I know many people are frustrated by others using the phrase “commit suicide” instead of “died by suicide.” I say the latter only out of respect for those who are offended by the former, but honestly, I am not bothered by that phrase either. It’s just semantics to me. Recently, as I was driving through my neighborhood, I came across a couple of posted signs (pictured below). I was shocked to see them. I understand the message: watch out for deer running into the middle of the road. Again, I get it. In fact, it’s almost a creative spin from the norm. For some reason though, this time, this one stung a little bit. Why couldn’t the sign just say “caution” with a picture of a running deer? I actually winced. I cringed. I made that face that one makes when someone in the room says something so inappropriate, there is no recovering from it. I thought about pulling over and finding the person that posted these signs to gently share with them what suicide means to those left behind. I would not demand they remove the signs, how could I? Instead, I would simply educate them on what that sign means to so many of us in this world. Conversely, I also thought, “It’s no big deal, let it go.” But, maybe it bothers others, too, who are too timid to say something. Maybe I should say something. Maybe I should let it go. I kept driving. I’m curious what my fellow survivors think about this sign. Is it offensive to you? Do you care? Does it hurt? Would you say something to the one who posted it? As a fellow survivor, tell me what you think. I’d love to hear your thoughts/feelings on this sign. No ! I do not like this at all . It makes suicide seem light and funny . It is not . You summer it up for me too Kay! It does make light of suicide. We lost our eldest son two years ago. I don’t care for it as someone who has experienced the loss from suicide. I think it’s one of those flippant remarks like when someone says something is retarded around someone that has a child with Downs Syndrome. I think that sometimes we should have a little forethought to our uses of words. I’ve caught myself saying suicide related things I’ve said in the past flippantly still after the fact; but at least now I pause and stop. We can’t condemn but I think gentle reminders work. It hurts me. It is offensive to me. It does not make me mad, just incredibly sad. I would not want to drive by it more than once. I would either say something or avoid that road. I think it’s inappropriate, insensitive and unnecessary. “Caution” and a picture of a deer is all that’s needed. After all, that’s the standard posting. The pictured sign is a flippant reference to suicide. Obviously, the person who posted it has not been impacted by suicide of a loved one. Dear Brandy, I wish I didn’t react to the often ignorant things people say. I’m getting better at it slowly, though as recognise the person is unable to understand how it may hurt. I will if given the chance try to gently educate them as to why the word commit is no longer used. I’ve said it myself many times as that was the word used back when my mother died and it sticks. The sign however is different. I guess again here the person who put it up, like you say would ha ve no idea how hurtful it could be. The thing that strikes me is that the it isn’t a fact. The deer are animals that are liable to run out in the road, probably not because of being in pain or wanting to end their life. It strikes me that the word may be painful to me and others because some innocent or ignorant people may find it amusing. It’s flippant and that hurts. Jokes about suicide are inappropriate because they may hurt someone and society needs to be more sensitive to the pain the culture may inflict without thinking. We all have a responsibility to educate one another in any way we can. What if the loved one ran in front of a car or drove into wall or off a cliff intentionally? This sign would ruin their day, perhaps their week , if they were in recovery. Otherwise, it would merely reinforce their sense of ongoing horror and pain. It is unbelievably tacky. Actually makes me feel nauseous. What does it mean in any case? That there are deer waiting at the side of the road to run in front of a car? Defies belief that someone didn’t think this through before putting it up! I do not like it at all. 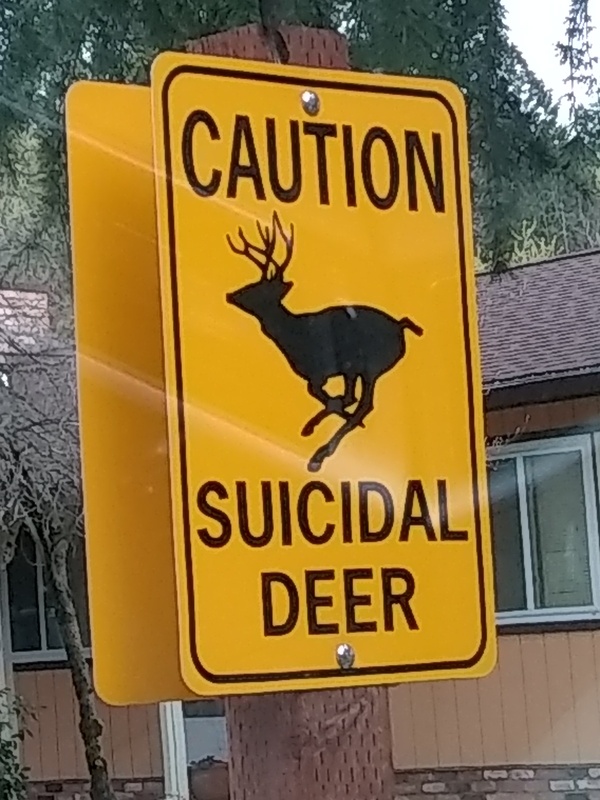 I find it very offensive and I feel like they are using suicide as a humor for warnings about the deer in the area. There is NOTHING funny about suicide whether it is referring to humans or animals. I am sorry. I don’t like this at all. When I saw this picture, it almost made me panic. I would definitely go to the authorities and have them take that down , and put up a “ Caution: Deer crossing, etc. I have had people make insensitive remarks, but that sign to me was highly offensive, hurtful, and exceedingly painful to look at. Thank you for sharing, Brandy. This sign is completely inappropriate. It was an attempt at terrible humor. Let them know ASAP . I find it insensitive, made me wince a little too. Intended to be humorous, but I’m pretty sure the deer don’t want to die, just like many humans don’t actually want to die. People don’t get it, they have no idea how painful it is to deal with this kind of loss and say inappropriate things all the time. Like you, I usually just shrug it off. They don’t know. I experienced an incredibly awkward situation where I was standing at the reception desk paying a bill at the doctors office when the Stoneman Douglas high school shooting was unfolding. All of the staff was looking up at the TV. The receptionist said to me, “Don’t you wish mental people like this would just kill themselves?” I stood there shocked, paid my bill and quickly left. I wanted to send in a note telling her who I was and my story…and that no, I don’t wish people with mental problems would just kill themselves. I’m sorry that young man killed innocent students and that the system failed in so many ways to prevent it. One thing I’ve learned in this journey is that you just don’t know what the person next to you is dealing with or has been through. Yes, it hurts. If I came across the person who came up with the signs, I might tell them that how having lost a loved one to suicide the sign hurts me and that every time I drive by the sign it’s a constant reminder and punch in the gut. Very insensitive, very ignorant not funny at all. I pray the people who thought these signs were funny never have to feel the pain suicide survivors feel on a daily basis. It reflects pure ignorance on the part of the person who put it up. When my sister’s suicide was more recent it would have made me sick to my stomach and I definitely would have sought out the source and spoken to them. That said, for the sake of other survivors, it woul probably be the right thing to do. The one thing I cannot tolerate is the “gun to the head” gesture. But I deal with that on an individual basis and it is usually received well. People don’t understand what they are doing and sometimes need to be gently educated. As the years have gone by (17 plus now) I find stuff like this bothers me less. But I hear you about the cringe – and my heart does ache for anyone who is hurt by this. I know the word “suicide” jumps out at me, still – seems like, for example, there used to be a lot more about “suicide bombers” in the paper than there has been lately. I know for those whose loss is recent, signs like this would not be funny at all, but very painful. That said, I think it’s good to say something when we get the opportunity. I know my daughter, who was nine when her brother took his life, will always say something when someone makes the aiming motion near their head, especially about something dumb like, “I forgot my lunch.” She’ll say, “Please don’t make that motion” and tell them why. I’m proud of her for speaking up, something that does not come naturally for her. I try to honor other people’s word use by using the words they are comfortable with. I know at first, I would explain Brian’s death by saying, “He chose to take his own life.” That was more comfortable for me at the time than saying the “S” word. I myself wouldn’t get out of my car and knock on the nearest door of that sign, but if I saw someone putting it up, and it was on a street where I could safely park, and I wasn’t in a rush, I might get out and say something to the person. Sadly, and as we all know, life goes on, and for most people, suicide is an abstract, somewhat mockable, somewhat no-big-deal thing – until it comes knocking closer to home. We need to grow tougher hides, I know, but never at the expense of tender hearts, I hope. Also, and finally, one of the best pieces of advice I got in the first week after my son’s death, was that I can ALWAYS say, “I don’t want to talk about that.” to any question or comment made. AND, it’s always okay to just turn around and walk gently (or briskly) away from someone who says something painful. Take care – we walk a tough road. Find friends (often new friends) who can understand and walk with you. Thanks, Brandy! I’m proud of your daughter, too! That’s awesome! So, as a suicide loss survivor if I get the opportunity to let people know that remarks can be hurtful I do! I too am not offended by “commit suicide” but I agree, that sign crosses a line for me. Someone unaffected by a loved one’s suicide maybe thinks nothing of it. But I’d hate to have to drive by that sign every day. The term suicide isn’t even appropriate in that context, which is why I’m sure it’s probably supposed to be funny. But it definitely strikes a nerve. seeing this sign while driving would make me cringe too, and probably tear up, blurring my vision as it is now. and it’s been almost 8 years. I don’t find it amusing at all. It does hurt but I think whoever came up with this found it amusing. I’m sure whoever came up with this has never had to deal with suicide. Totally unacceptable, inappropriate, and ineffective as a message to drivers to observe caution. It also seems to impart intent and fault to the deer. The DOH needs to be notified and sign replaced. I agree. People say things all the time. Not to be mean or malicious-they just don’t think-or remember you have lost someone. Sometimes I want to just say “how can you speak like that around me”. But I don’t cause I know they don’t mean it. The sign is just stupid. Unless I knew the people I wouldn’t go up to them. You never know how people react. I am deeply offended when I pick up a dessert menu and see “suicide cake” or “suicide by chocolate” etc. That literally makes me ill! Why does a bakery chef or restaurant owner think naming a dessert “suicide” is appetizing? It’s only been 9 months since I lost my mom. Since then I have seen how common it is for people joke about suicide. Things like “Oh I just want to kill myself!” or making the gun motion to their head when they are trying to express not wanting to be there. I can’t entirely blame them for being insensitive, they just have absolutely no idea. I haven’t yet corrected anyone but I feel in the future I will educate people on this. Whoever put this sign up has no idea what depths of pain a person goes through when they lose someone to suicide. I would have been upset to see that driving down the road. People just don’t get it. I find this sign distasteful, disrespectful and uneccessary. It’s unfortunate that suicide is so uncomfortable for people to talk about that it has become a taboo. Taboo leads to ignorance which leads to things like this. My heart goes out to any fellow survivor that has to drive by that sign. That’s something I think I would comment on, to the business. That’s something that should be addressed, as it’s so public – and easily changed. It has been 18 years since my husband committed suicide. Three years ago, I accidentally hit a deer running across the highway. She was a big doe and destroyed our car, and herself. I’m sure she was just looking for a way to get safely across the road. I don’t like the sign you are referring to…for people or for animals. If I lived in your area, I would definitely find the right person to speak with who could replace that sign with something more appropriate. I don’t find the sign too bad. Maybe it’s because it’s an animal and I don’t find it as closely related to my own personal loss because of that. But unlike you, “commit suicide” really bothers me and “career suicide” makes me think of my own loss. We all have our own triggers and your response is completely legitimate. I think it might be good to talk to the person who created it. I get that it’s funny to someone who hasn’t experienced suicide in their lives but it’s good to be mindful of the experiences of others. I hope if you do chose to approach this person that they’ll be kind and willing to hear your perspective. Not cool. Especially since my 19yr old completed suicide by ejecting himself out of my car on the freeway. No, I’m not okay with it. There is no humor in suicide. I find it insensitive, offensive and ignorant. I lost my 19 year old son to suicide it’s no laughing matter. It is horribly painful would personally take the time to approach whoever is responsible for posting this sign and I would make it an educational opportunity. I wou ate a longpicture of my boy to tell show the impact that this sign has on those who lost a lone to suicide or those who smuggle with suicidal thoughts. In our politically correct world, I find it ridiculous that a sign like this would be approved much less on the roads. Not only is it thoughtless, flippant and a mockery of suicide victims and suicide survivors it’s now a daily reminder to someone passing by who may actually be considering suicide. Having lost my son only one month ago to suicide, this sign hurts. It is flippant, and I don’t think the owners understand the depth of pain this sign conjures for some suicide survivors. However, I’m not at a point in my journey where I could confront the owners. I would simply drive a different route if possible. Hopefully, with time, I will be more bold in gently educating the public. I find the sign very offensive and insensitive. That sign is hard to tolerate… my husband hung himself I have a difficult time with”hanging references” even hang out …just makes me cringe… Some day one day I pray that association will be less painful in the meantime can’t people use their minds! I find this very offensive! Obviously, the person/business who put this sign up has no common sense! Yes the sign bothers me. I find it rather distasteful. In fact I am bothered by individuals that put their fingers up to their temple (referencing shooting themselves in the head or “blow my brains out”). I’ve asked my co-workers repeatedly to not do this. My brother died by suicide, shot himself in the head. Brandy, I don’t think that many who have lost a loved one to suicide would feel ok with this road sign. The comparison alone shows how desensitized people can be and how little some people understand about suicide. Clearly, they have not walked in our shoes. What to do? You can ignore it (I’ve often had to take that road) or you can attempt to change attitudes. It’s not easy to know which choice is best. If this sign is in your community, perhaps you can present a very different view and send it to the editor of your local paper. I’m not sure if it would help but it’s just a thought. I can see a serious comparison. The deer have become strangers in their own environment and in running from that they are blindsided. The same is true of someone who is struggling with depression and mental illness. It’s not really about choice at all. Those who understand think much more deeply. Unfortunately, not all do. God bless ignorant people, may they never KNOW. I empathize with all of you and know the pain we all share on this path to healing. I lost my son over 4 years ago and still find the pain overwhelming at times. I know it is a journey I’ll be on for the rest of my life. The sign you spoke of is intensive and a reminder of our terrible loss. of a loved one in the most horrible way, by suicide. The worst comment I have ever heard regarding suicide is “…that is murder ….he murdered himself” spoken by someone who obviously does not understand how hurtful these offhand comments are to survivors of suicide loss. I don’t like it at all! I personally would say something but probably only after I spray painted over it (no I am not encouraging anyone to destroy someone’s public or private property). That’s just how enraged it made me feel at first glance. Suicide is not funny. There is absolutely nothing comical about someones pain and suffering. My daughter was only12 when she took her own life that was 15 yrs 9 mos ago. I too have made several attempts and honestly don’t know how I survived most of them. I have and will continue to say something to anyone who disrespects (intentionally or not) my daughter which is exactly what I think about this sign. I apologize, I still have a lot of pain and anger inside of me as well as today should be my little girls 28th bday and I’m afraid this response may reflect that. I have not lost anyone close to me, but my perspective is no different from the lovely souls here that have. I am truly saddened by this sign for two reasons: 1) for survivors, it triggers in an unkind way thoughts of those first days of their loss, and 2) to echo a few other comments, it testifies to a great lack of knowledge for the tragedy that is suicide. Designed to be “cute” or “funny”, it is instead void of any understanding and compassion for the wilderness that so many loved ones have walked through. In 1994, my best friend died swerving to avoid a deer. Hit a tree, leaving behind two small children. It was the worst day of my life, until it wasn’t. That day was September 17, 2012. My only child, apparently ended her life. Details too graphic to repeat. It offends both ways. Ironic, insensitive, hurtful, not funny. I respectfully am not offended by this sign. I think that desensitizing oneself regarding issues like this is very important in the healing process. The humor that was conveyed with this sign, in my opinion was not intended to offend,. We have to, for our own sanity, have to give people a pass and let the normal world continue to function. Everything is offensive or hurtful to someone, but I think it’s the intent that needs to be examined and not just the comment,.